We’re getting into the busy season for filming in Atlanta and North Georgia, and it’s hard to drive through town without spotting at least one yellow sign during your commute. This month, we’ve got a few TV pilots, a bunch of new locations for the major movie productions, and a few newbie projects you’ll come to know well over the next couple of months. Baby Driver (production code: MILES) continues to dominate on-location shooting all throughout the metro area. The Edgar Wright-helmed action/crime thriller (starring Kevin Spacey, Jon Hamm, Lily James, Ansel Elgort, and Jamie Foxx) closed out March shooting near Georgia Tech. On March 26, they shut down Freedom Parkway for some stunt work (scroll down to see a video of the car flip). Crews moved downtown after that, shooting near Peachtree Center on April 1. After a two-day stint at Pullman Yard, signs were spotted around Georgia State on April 6. Crews continued to shoot downtown the following week before moving to Monroe and Juliette on April 17 and 18, respectively. Most recently, some scenes were filmed at Fulton County Airport. Hidden Figures (ROCKO), the film championing the African-American mathematicians who contributed in the early days of NASA, popped up a few times around town this month. A basecamp was set up at the Collins Memorial United Methodist Church on Bolton Road on March 28. On March 30, crews placed signs at the intersection of East Point Street and Ware Avenue in East Point. This past week, production returned to Dobbins Air Reserve Base, where a large portion of filming has already taken place. Look out for Kevin Costner, Octavia Spencer, and Kirsten Dunst, all starring in the film. There’s a new comedy you might see quite a bit of in May. Production has begun on Office Christmas Party (OCP), starring Olivia Munn, Jamie Chung (Mulan in Once Upon a Time), Jennifer Aniston, and Jason Bateman. The film follows an office manager who learns his branch will be shut down. He decides to throw an epic Christmas party to impress a new client and thus save the office. (As you can imagine, things quickly spiral out of control.) On April 9, OCP shot outside the AT&T Midtown Center. On April 11, filming took over the St. Regis Atlanta in Buckhead. A nearby basecamp was located at Peachtree Presbyterian Church. Next week, crews will head out to Hiram. Thank You For Your Service (TYP), starring Haley Bennett, Miles Teller, and Amy Schumer, took a trip to Acworth on March 24. Production then returned ITP, shooting on Murphy Avenue adjacent to The Metropolitan. Thank You For Your Service closed out March shooting in Dallas and at the Clermont Hotel. On April 5, more signs were seen intown at I-20 and Lee Street. Notorious (NOTOR), which explores the relationship between media and criminal law, has spent a good portion of last month shooting in Midtown and downtown Atlanta. Between March 25 and 29, the show was set up near the Gold Dome, working from Five Points all the way east to Piedmont. March 30 was spent in Midtown. In early April, filming moved across the Connector, shooting at the Georgia Public Broadcasting building. The Jury, a murder trial drama, filmed right outside the Atlanta magazine office at 260 Peachtree (the Coastal States building) on March 28. The building lobby was used as well. On March 30, additional scenes were filmed at Emory’s Briarcliff Campus. 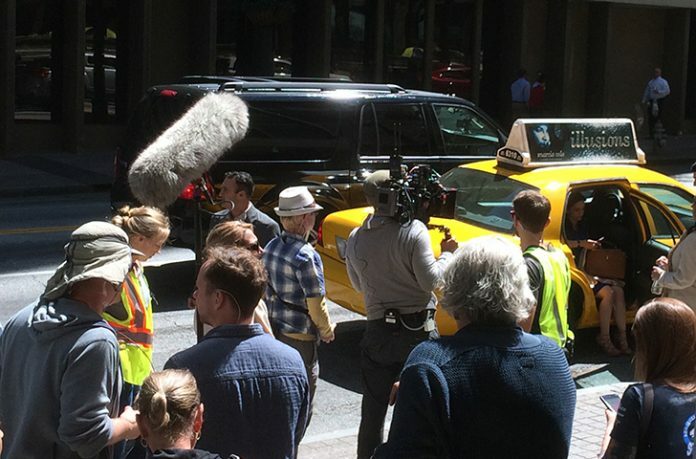 ABC pilot The Jury brought in cabs to recreate downtown Atlanta as New York City. Hail Mary (HM), which focuses on a small town mayor who must launch an unconventional plot to save her town, has spent a good deal of time shooting in far North Georgia. On March 26, production came to Decatur for a scene at Agnes Scott College. For the remainder of March, production was based in Dahlonega. In April, filming shifted much closer to town: The pilot returned to Decatur on April 1, and on April 5 crews started working in Conyers. Next month, be on the look out for When the Street Lights Go On (LIGHTS), a pilot being produced for Hulu. Tomorrow, they’ll be shooting near Newnan. Meanwhile, for Atlanta’s established TV shows, Game of Silence (GOS) signs were plopped at Peachtree and Piedmont Roads on March 28. Survivor’s Remorse (SRS3) shot at Colony Square on April 12. Rectify (RECTiFY), now shooting its final season, was in Griffin on April 11. AMC’s Halt and Catch Fire (HCF), was spotted off of the Glenridge Connector on March 23 and at Kimball House on April 18. The Originals (TOGS) spent the first week of April in both Cartersville and Madison. Home Free (HF) had a massive construction project in Dallas at the end of March. Crews there also worked under the name BARTLETT. And before we go, we’ve got some exciting Marvel news: As you might have heard this past winter, Spider-Man is coming to Atlanta. Rumor has it production will start on the new Spider-Man film soon, so keep an eye out for anyone who does whatever a spider can. And unlike Guardians of the Galaxy 2, which is locked away safely inside Pinewood Studios, this superhero film will likely have plenty of on-location shots to spot around the city. Can’t wait? Check out this video about the practical effects used when Captain America: Civil War shot here last year.